If only all playwrights set about to craft plays this monumental. Daina Michelle Griffith, Phillip Winters, Penelope Lindblom and Shaun Cameron Hall in the REP's All My Sons. 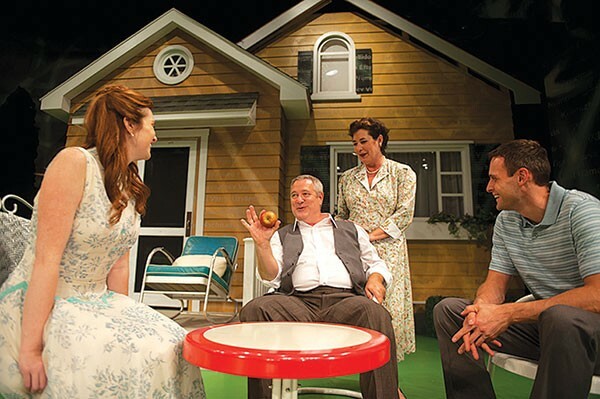 All My Sons was Arthur Miller's first hit show, and with a new Playhouse REP production — directed by Robert Miller (son of Arthur) — you have an opportunity to see how firmly in control Miller was even at this early stage. Much of Miller's work is now placed in the "well-made play" genre, which makes me laugh. In today's theater, "well-made" is a genre and not a goal. 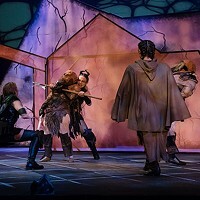 Vivid individualized characters in fat-free vehicles constructed like iron-plated battleships: If only all playwrights set about to craft plays this monumental — instead of exploring banal artistic trends — my job would be a lot easier. It can be said that Miller gets a bit melodramatic: If two emotional plot points ended sooner, this play would be even more powerful. But that is, believe me, a very minor complaint. Miller fils is smart enough to recognize the strength in the script and, for the most part, lets the production do what it's designed to do. (That's much trickier than you'd think.) He's done a good job getting strong performances from his company. 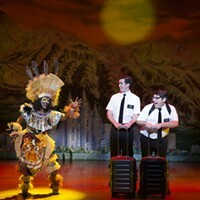 But he hasn't gotten the same performance: There are several different acting styles on stage, and to say that's distracting would be something of an understatement. Daina Michelle Griffith and Phillip Winters seem the most organic; these are uncluttered, straightforward performances in sync with the time period. The role of Chris, so firmly fixed in heady post-WWII optimism, might be unplayable in such a cynical age, but Shaun Cameron Hall gives it his all. Justin Fortunato hits up the melodrama as the bad-news messenger, and by playing her subtext on top, Penelope Lindblom gives a quite modern performance. Like I said: Mashed up together it's a bit jarring. Still, All My Sons is too infrequently performed in Pittsburgh, and this production gives you a taste of what you've been missing.